Greetings, fellow Happy Hunters! 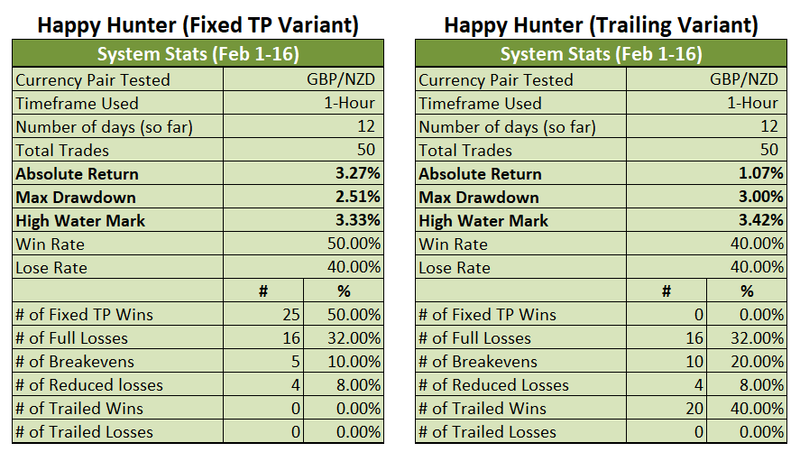 A new week is coming up, so let’s take stock of how the two variants of the Happy Hunter Price Action Trading System fared last week, shall we? With all of that out of the way, it’s time to finally discuss how the week went. And as usual, below you’ll find a chart for the testing period from February 12-16. The numbers on the chart refer to trades that were closed during the course of the week. And below the chart is a table wherein the details of each trade can be found. You can click on the table to enlarge them, by the way. Oh, do note that trades #51, #52, and #53 are still open, so they weren’t included in the table. They’ll show up in next week’s review. Trading conditions from February 12 to 16 were highly unfavorable all throughout since daily volatility was abnormally low. 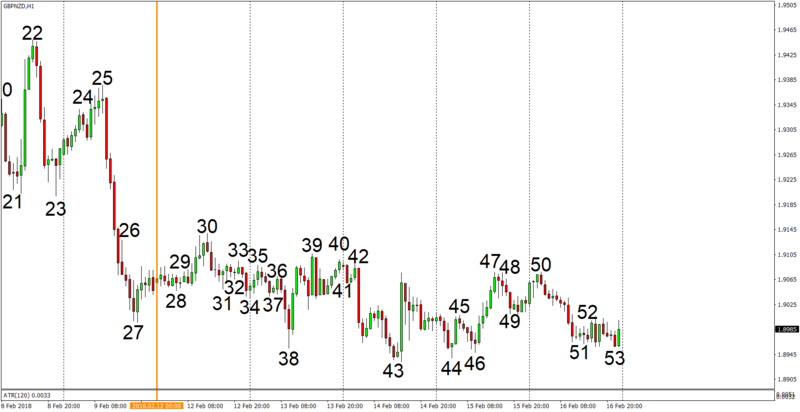 And for reference, the average daily range on GBP/NZD is around 225 pips, based on historical data from 2007-2017. And to make matters worse, GBP/NZD was practically trading sideways this past week. But at the same time, ATRH was relatively big and many hourly candles were even bigger than the ATRH. These trading conditions made it difficult for the system to reach TP. 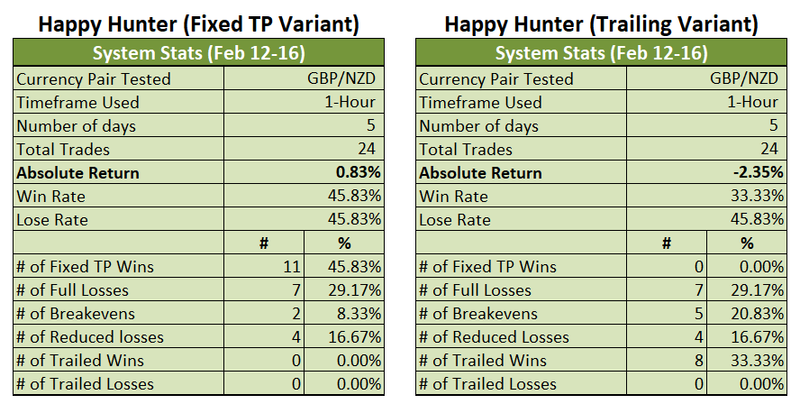 Even so, the Fixed TP Variant was able to eke out a 0.83% gain for the week, which is a bit disappointing, but not too bad, given the tough trading conditions. As for the Trailing Variant, it had a really bad time this past week, suffering a loss of 2.35% for the week. The Trailing Variant was designed to ride trends, so the sideways price action and low daily ranges really did a number on the Trailing Variant. And the Trailing Variant’s winning trades just couldn’t offset the losses because the large hourly candles this past week made it difficult for the trailing rules to preserve profits. I actually encountered this problem about preserving profits during the backtesting phase. However, I couldn’t find a workable solution at the time. I’m currently testing out some ideas, though. And hopefully I’ll be ready to roll them out in the upcoming week or the week after that. That also means I’ll have to redo the backtest results and the forward test results, which is a real bummer. Oh, well. That’s just how it is. Gotta keep proper records, you know. Anyhow, I’m also revisiting the rules for Entry Type 2. Basically, I’m reviewing whether or not it would be net profitable to keep the buy stop or sell stop orders based on the original HHHL and LHLL patterns respectively. You see, based on forward test results from February 1 to 16, keeping the orders on the original HHHL and LHLL patterns were net negative for the system. However, they were neutral on balance during the backtesting phase. To resolve this, I need to do further backtests. And I’ll hopefully have the results out by the time I finalize the solution to the problem with preserving profits whenever there are large hourly candles. 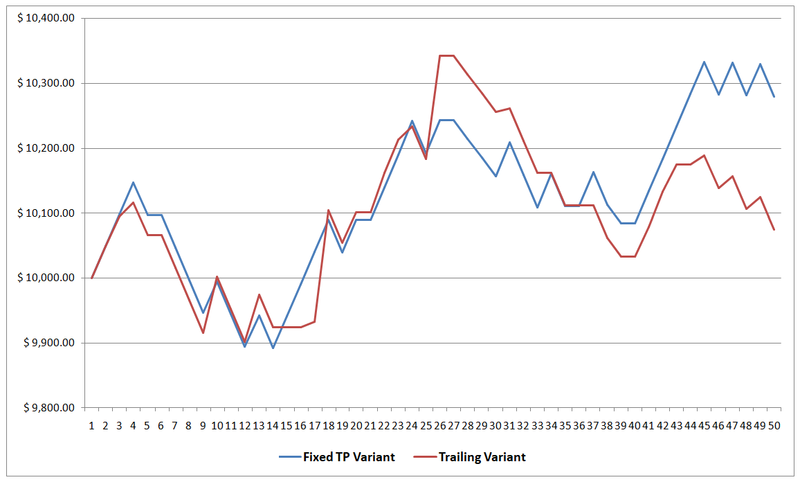 Looking at the equity curve for trades from February 1 to 16, we can see that the Fixed TP Variant does what it was designed specifically to do – slowly but consistently build up gains over time. And as of February 16, the Fixed TP Variant was up by 3.27%, slightly down from its high water mark of +3.33%. The Trailing Variant, meanwhile, is having a hard time because of the tight trading conditions and is now only up by 1.07% after reaching a high water mark of 3.42% previously. Anyhow, tune in until next time. And as always, I enjoy your feedback. So if you have any questions, or if you see a possible error in my work somewhere, or if you just want to say “hi” then don’t be shy and write a comment down below!